Pixi Glow Tonic-100ml is rated 4.5 out of 5 by 2. 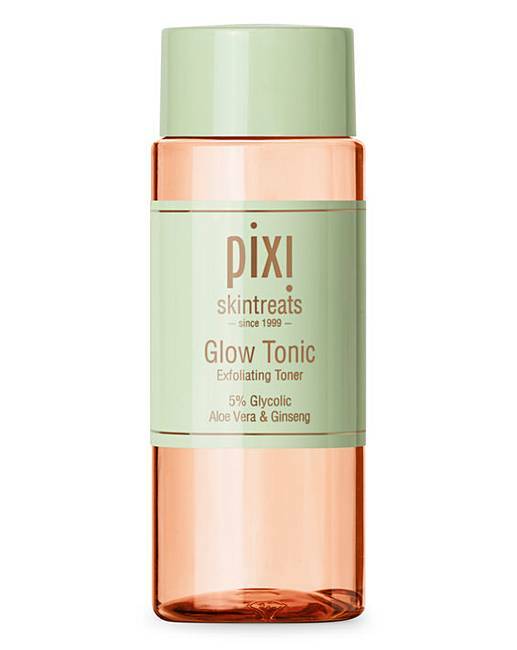 Pixi Skintreats Glow Tonic exfoliates and purifies the skin with 5% Glycolic Acid. Ginseng improves circulation and energizes. Added Aloe Vera soothes and hydrates. It refines the appearance of pores and gently accelerates cell renewal to reveal a brighter, glowing complexion and balances, heals and soothes for radiant, healthier looking skin. It's alcohol free, suitable for all skin types and is not tested on animals. How to apply: Can be used either in the morning or night or when needed. First cleanse your face before saturating a cotton pad with the Glow Tonic and sweep across face, neck and decolletage (avoiding eye area). Rated 4 out of 5 by Hun from Very nice I brought this as I have see it be for it works well very please. Rated 5 out of 5 by Nadd from Clear skin! I’ve been using this for about a month and my face feels and looks fantastic. I do get spots here and there too and this has worked wonders for them. I also suffer from sensitive skin and so many things bring me out in a rash but not with this. I love this and I will continue to use it.